"Mother's Necklace, Serenity Pearl and Birthstone Necklace"
Simple, elegant and meaningful ~ the Serenity mother's necklace embodies everything we strive to design at Nelle and Lizzy. Each child and/or family member is represented by a birthstone. Simple, elegant and meaningful ~ the Serenity mother's necklace embodies everything we strive to design at Nelle and Lizzy. Freshwater pearls are wire-wrapped in 14 kt gold. 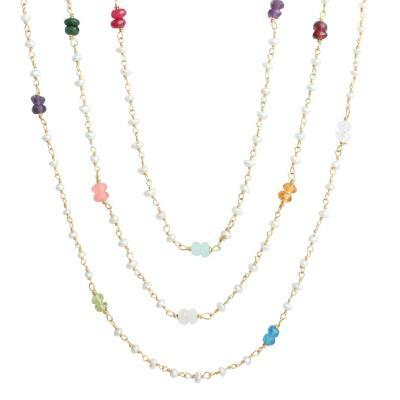 Then we add the birthstones of your choice to represent each family member. You can have each of the kids represented or you can include the entire family! The listed price is for one birthstone; if you add more stones the price will increase. Dimensions: Stones are approx. 3mm in diameter. Necklace has a 2" extender chain. Stones will be spaced according to how many are chosen. The more stones, the less the distance between the stones will be. See pictures for various lengths.